The world of higher ed enrollment management is always operating in the future. If you oversee undergraduate enrollment, chances are you are already looking at next fall’s enrollment goals. If that’s the case, you’re likely wondering how you’re going to be successful. Where will those additional leads, apps, and enrolls come from? What worked and what didn't? What should be done differently this time around? As a former college director of marketing, I’ve asked myself those questions. I needed to increase my qualified lead pool and knew there had to be a better way than just doing more of the same: buying more names, attending more fairs, sending more viewbooks. Higher ed marketing is often defined differently, depending on the institution. For some EDUs, marketing is a broad term that covers any official communication coming from the institution, regardless of audience; for others, marketing means creating captivating viewbooks, alumni magazines, or landing pages. No matter how your institution treats it, successful marketing in higher ed boils down to one thing: generating enough qualified leads to hit enrollment goals. You can buy names or inquiries. This is easy on marketers, because you can purchase all the leads you need from one source, but it’s hard on your admissions team, because these leads don’t convert well. You can generate your own leads. This is harder on marketers because it requires time, expertise, and staying up on trends, but it also generates quality leads that convert and retain. When I work with institutions that relied mainly on list buying as a marketing strategy, I find that they can increase their enrollments by 12-15% simply by adding a digital marketing strategy that focuses on lead generation. In this post, I’ll walk you through the most important digital marketing strategies for higher ed, and help you determine which channels are the right fit for your brand offerings. First, let’s get a few things clear by defining exactly what we are talking about. Digital marketing means using web-based platforms like search engines, websites, and social media to promote your brand, colleges, or programs. There are two ways to use digital marketing: organic (or free) and paid. Organic marketing refers to things like social media posting, which helps build your brand and community. This can result in leads, but more often the focus is on communication, positioning, and engagement. Quick implementation. It doesn’t take long to get a digital marketing campaign up and running, especially when compared to print, outdoor, and other more traditional channels. Trackable. Once a campaign is running, you can easily see and monitor where your traffic, leads, and applications are coming from. High conversion rates. Leads that come from search engine optimization will be your highest converting leads; in my experience, website leads typically convert at least 10x higher than purchased leads. Adjustable. Because everything is trackable, you can adjust things based off of real-time performance. Need more leads this month? You can adjust your budget to increase lead flow. Conversely, you can decrease spending if you've already hit your lead goal. You can change your messaging or calls to action in real time. For example, if you have an application deadline coming up, you can create urgency by adding a date or introducing an incentive, with just a few clicks. A/B testing allows you to run two digital ads or messages for a trial period, review the results, then continue with the ad that performs better. Barrier to entry. Managing a paid digital campaign takes a certain level of expertise, which means you need to either work with a partner like us, or hire someone internally who has learned the various digital marketing platforms. Staying current. Google updates its algorithms an estimated 500-600 times each year. Staying up-to-date requires a lot of time and attention, and not doing so can cost valuable advertising dollars. The first place to start any digital marketing strategy is conversion rate optimization. CRO is the process of making sure your website and its pages are converting as well as they can. CRO is important, because your site is likely causing you to miss leads and enrollments that you already paid for. A certain landing page gets 1,000 monthly visitors, and converts at the national higher ed average of 2.6%, resulting in 26 leads or apps per month. After a few small changes based on best practices, that conversion rate jumps immediately to 5%. The next month, that same page with the same traffic would return you 50 leads. If the additional 24 leads convert to enrollments at 13%, which is toward the low end for website leads, that’s three additional students that were generated, without increasing your spend. In this example, the cost per lead gets cut in half and an additional 26 enrolls are generated over the next year, at no additional expense. And this is just for one page - the same proven techniques can be carried out for all program and landing pages. It’s a relatively quick fix, but the benefits are long-term because you get those additional leads every month, from that point forward. If you're interested in learning how to unlock these hidden leads, I invite you to watch this free training video that we did recently. After ensuring that your pages will convert traffic as efficiently as possible, the next step is to increase traffic to those pages. The first place to start doing that is SEO. SEO will produce your most affordable and highest-converting leads. That has been true for every school I’ve ever worked at or with over the past 18 years. I’ve been on hundreds of .edu sites since the start of the year, and while more schools are starting to show evidence of some level of intentional SEO, the majority still have easily-correctable technical issues that are severely harming site performance. If you haven’t invested in SEO yet, a good first step is to reach out to a higher ed digital marketing partner who performs SEO and ask them to perform a free audit on your site. They’ll most likely do it to win your business, and it will give you a good idea of the company’s capabilities. The findings and scope of the audit will help you determine if you can handle SEO internally or need to outsource it (*ahem*, we know a good company if you need a recommendation). Pay Per Click (PPC) or Google Ads is a valuable channel to explore for lead generation, especially when paired with an SEO strategy. This allows your brand to appear in search results for whichever terms you choose. Ten years ago, PPC offered lots of opportunity for EDUs. As more and more schools jumped into the PPC waters, including aggressive for-profits and lead aggregator sites, competition drove up prices to the point where the education industry was spending more PPC dollars than all but three other industries. Competing in PPC was not really an option for most non-profit colleges. As competition increased, PPC leads were costing more and many institutions began dropping their PPC activity. Over the past two years, I have analyzed the PPC spend for dozens of non-profit institutions as a part of competitive analysis studies, and I have not found a single university that is spending more in PPC now than they were 1-2 years ago. Running display ads on the Google Display Network. While display has a lower click through rate than search ads, the lower costs and increased impressions more than justify the usage. If you need to generate traditional undergrad leads, you should consider paid social media advertising because that’s where your target audience is spending a lot of their time. If you’re marketing online or graduate degrees, there are specific platforms that offer great targeting options for you. I’ll highlight my three favorite social platforms for higher ed lead generation, and include tips for how to get started in each application. 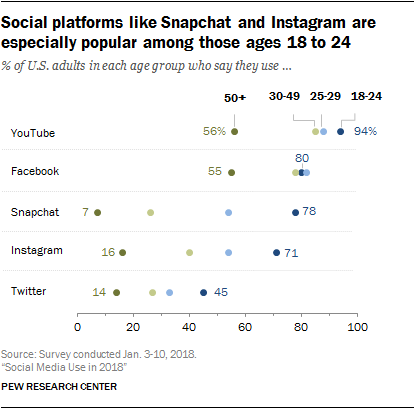 According to Pew Research Center, roughly 80% of U.S. adults ages 18-49 use Facebook in 2018. Among all social media applications, Facebook offers penetration into the widest range of target audiences, making it a logical first step into social media advertising for EDU’s, no matter if they are promoting traditional, adult, graduate, or online degrees. At a minimum, every school should be using Facebook’s retargeting feature, which allows you to retarget leads from your CRM and visitors from your website. This is very cost effective, generates a lot of impressions/awareness, and moves prospects down your funnel without taxing overworked admissions recruiters. Facebook also offers ad types that allow prospects to provide their contact information to you in one click, without leaving the app. We could go on, but you get the idea. Instagram is where your target audience is spending a lot of their time: averaging over 3.5 hours per week, in fact. They likely aren’t spending that amount of time each week sending emails, perusing college websites, or reading through viewbooks. At Little Foxes, we are big fans of using Instagram for higher ed lead generation, and not just for the reasons listed above. Very few EDUs are taking advantage of Instagram’s latest lead generating features, offering low levels of competition for early adopters. Instagram, which is owned by Facebook, is an easy add-on once you get begin using Facebook’s ad platform. And the two pair nicely together: Instagram allows you to target your page fans from Facebook, as well as those who engaged with your Facebook ads, posts, or videos. Because 91% of Instagrammers also use Facebook, there are some built-in easy wins. If you’re looking for more tips on growing your Instagram audience and engagement, check out our top 10 tips for EDU Instagram growth – it includes a free download. Instagram is continuing to provide new ways for EDUs to generate leads through the app. For a deeper look at using Instagram for lead generation, check out our recent post: Increase the ROI From Your College Instagram. LinkedIn is the best place to start for generating grad and online program leads. Not only does it provide an intersection of ideal target audience and in-depth targeting capabilities, but it provides what most other platforms do not: intent. Company name. Target people that work at specific companies that your institution has articulation agreements or partnerships with. Job title or function. This level of specificity is helpful for targeting those who are a fit for your graduate degree. Schools attended and fields of study. This is helpful for institutions with a niche (i.e., faith-based or gender-specific institutions). Years of experience. You can eliminate those who have too little or too much experience to need your grad degree. Groups and interests. This helps identify those that might be looking for a career change or lateral move. Users of LinkedIn are looking to advance their career or professional development in some way, making them ideal candidates to be interested in graduate degrees. No other app offers this level of stated intent; compared to Facebook, who’s users are interested in social interaction, LinkedIn is like advertising to a stack of needles, without the haystack. As highlighted earlier, one of the benefits of digital marketing is that it can be implemented quickly. Little Foxes offers short-term contracts that allow our higher ed partners to test out new social channels. If you’re looking for strategic help with your digital marketing efforts or searching for a partner to manage and optimize your existing campaigns, you can learn more about Little Foxes capabilities here.